En papillote means 'wrapped in a parcel', which keeps the food very moist, cooking it in its own steam. If you cook this dish on the barbecue it will have a more intense, smoky flavour. Preheat the oven to 200°C, gas mark 6, or prepare the barbecue. Snap any woody ends from the asparagus and discard. Take 2 x 30cm squares baking parchment and place each piece on top of 2 x 30cm pieces of foil. 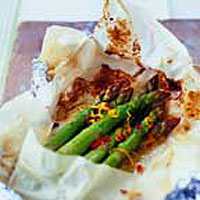 Split the asparagus into 2 equal bunches and place on the parchment. Top with the butter and chilli. Zest half the lemon and scatter the zest over. Make a parcel by folding over 3 edges of the parchment. Drizzle the juice from the zested half of the lemon into each parcel, then fold up the remaining edges and seal them tightly. Place on a baking tray. Cook in the oven or on the barbecue for 15-20 minutes, or until the asparagus is just tender. Serve each parcel with cod or salmon fillets or grilled chicken breasts and buttered new potatoes, with the remaining lemon cut into wedges. Cook the parcels as an all-in-one meal with fish fillets or prawns in the parcel, too. Cook as above, or until the fish is cooked through.